Spring is in the air and so are a lot of birds looking for places to start families. And though the odds are stacked against them like an underdog in a boxing match, you can help give your birds a fighting chance to raise their young. Your yard is probably nothing like the set of the boxing movie “Million Dollar Baby,” but that doesn’t mean it’s drama-free. If anything, this is a drama-filled time for your yard. The early morning chorus is growing louder as birds sing to attract mates and defend their territories. Birds are courting and pairing up for nesting season. You can possibly entice some of the many cavity nesting birds to raise their families in front of yours by providing nesting materials and safely-located nesting boxes. With birds expending so much energy migrating, courting and looking for food, these helpful additions will make their lives a little easier. Protection from predators and proximity to food are a bird’s primary consideration when choosing a nesting site. 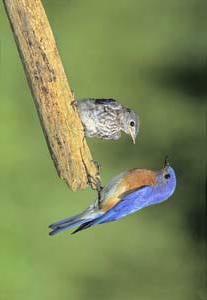 If birds do choose to nest in your yard, you can observe them as they build nests, lay eggs and feed their young. And when it’s time for the fledglings to leave the nest, they’ll likely learn to feed at your feeders and bathe in your bird baths. Visit us to learn about the birds that could nest in your yard and how you can entice them to stay there. We know the different nesting needs and preferences of the birds in our area, and we carry a variety of nesting boxes for specific bird species. We’ll make sure you have everything your birds need to have more than a fighting chance at successfully raising their families in your yard.